We shed hair every day as part of our body’s natural process. Hair loss can happen at any time of life for any number of reasons. When hair loss becomes a concern, it is important to determine the cause before seeking out the appropriate treatment. Age influences hair strength. As we grow older, there is a tendency for our hair fibres to become finer and shorter and we may experience hair loss or greying. It is normal for women to experience changes to their hair post pregnancy and as they enter the menopause. 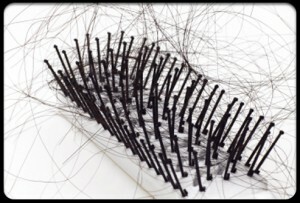 Genetic hair loss is the most common hair loss problem affecting men and women. The onset is usually during the mid to late 20s and is often unavoidable. Women experiencing baldness may want to consult a trained medical professional. Repeatedly losing and regaining weight can take its toll on your hair, causing it to become brittle and lacking lustre. Crash diets are often short in essential vitamins and minerals and over long periods of time this type of dieting will reflect in your hair. Hormonal imbalances including thyroid dysfunction can produce significant changes to hair growth and quality. Thyroid function can only be assessed by blood test. If you are experiencing considerable hair loss, please consult your GP.